On markets they have these big bags filled with lots of veggies, such as beautiful peppers. 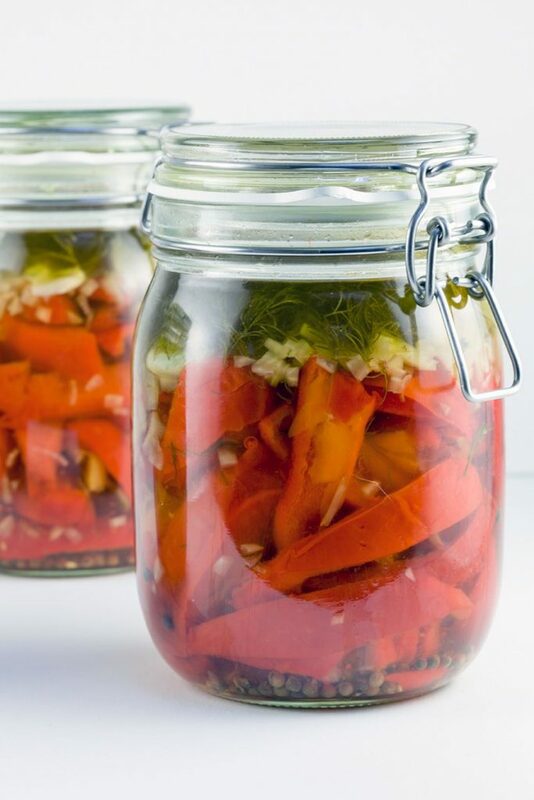 You can easily preserve them as canned roasted peppers. PRE-HEAT the oven to 250 degrees Celsius or 480 degrees Fahrenheit. RINSE the peppers and pat them dry using a clean kitchen towel. ADD the peppers on the oven grid in the pre-heated oven. BAKE them for about 15 minutes, or until they’re blackened a bit. TURN the peppers a few times during baking so they’re evenly blackened. Meanwhile FILL the large bowl with water and bring to a boil. 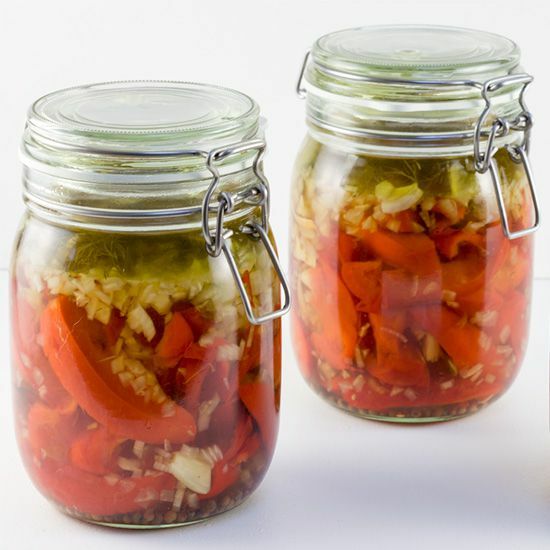 Sterilize the preserving jars by cooking them in the boiling water for a few minutes. Use the meat tongs to remove them from the water and place them upside down on the clean kitchen towel. REMOVE the peppers from the oven and let them cool off a bit, until you can easily hold them to remove the skin. REMOVE the skins, chop them into strips and add the peppers into a large bowl. PEEL and roughly chop the onions and garlic cloves. DIVIDE the onions, handful of peppercorns, garlic and a teaspoon of salt in each preserving jar. COMBINE 1 part olive oil, 2 parts vinegar with 1 part sugar and 1 part water. REPEAT until you’ve created enough liquid to fill the jars. There’s no need to measure this, it’s all about the ratio. 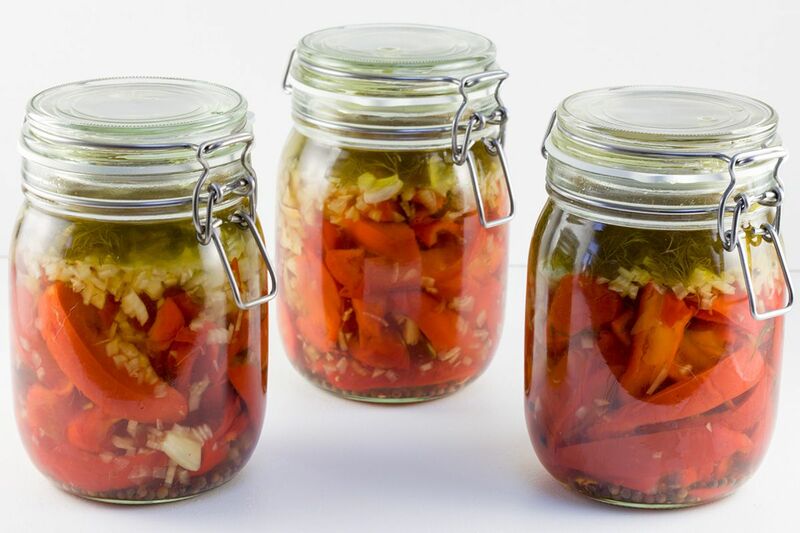 DIVIDE the jars with the peppers and then FILL each jar with the liquid. CLOSE the jars properly and keep them on a cool spot for up to a year.